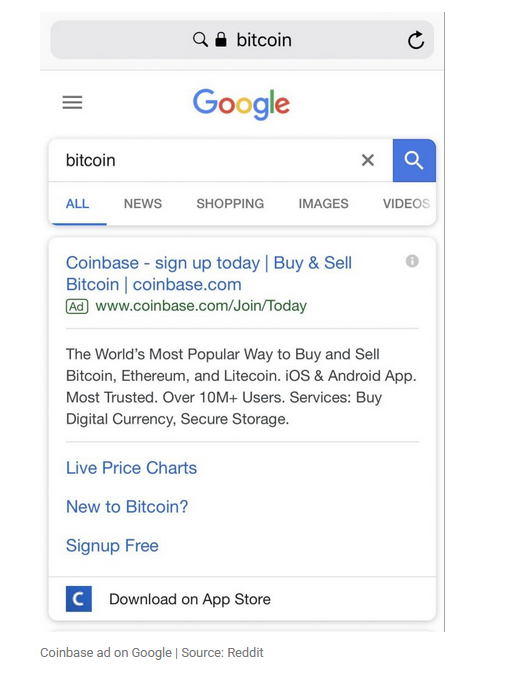 Coinbase, one of the world’s biggest cryptocurrency exchanges, can now have their advertisements seen on the world’s largest search engine. The news comes shortly after Coinbase CEO Brian Armstrong’s announcement last week that the exchange has been whitelisted on Facebook. To be approved for Google advertising, the company must be licensed by their country’s financial authority. Additionally, the ads and landing page must comply with all AdWord policies and necessary legal requirements. The announcement marks a huge win for the Coinbase team as Google processes over 3.5 billion searches per day, giving Coinbase exposure to billions of users. “After Facebook, Google does too. Bull is prepped :p Seriously though, even google search trends (for bitcoin) seems to have bottomed, finally, after months and months of falling. Manipulation or not, the way this bear started (ads ban, Korea ban) may also be the one to end it (restart of ads, Korea is back)." Thoughts on seeing Coinbase ads on Google again?